The FUJIFILM X-A1’s large 16.3 megapixel APS-C CMOS sensor captures rich tonal expression, increased dynamic range and sensitivity settings up to a maximum ISO of 25600. It also offers the ability to produce a beautiful “bokeh” effect – the aesthetic out-of-focus effect created when shooting with a shallow depth of field. The sensor will deliver clear images with low noise even in low-light conditions at night and indoors where high sensitivity would usually be required. The sensor faithfully reproduces natural skintones and the vivid colors of the sky, from deep blues to the red hues of the setting sun. The EXR Processor II offers quick responses with its start-up time of 0.5 seconds**, shutter time lag of 0.05 seconds and a maximum burst speed of 5.6 frames per second (max. 30 frames***), you will not be disappointed. All of the adjustable buttons and dials are positioned on the right-hand side of the camera’s rear LCD panel in pursuit of optimum operability and ease-of-use. When holding the camera with just your right hand, the buttons have been designed to allow you to access all functions and to adjust the settings easily. The Mode Dial allows you to select the optimum scene setting with access to an [Advanced SR Auto] mode, which automatically recognises a scene type for fail-safe photography, and an [Advanced Filter] function to add artistic effects to your photos. This is a camera that is designed to be compact enough to wear around your neck, without weighing you down too much. 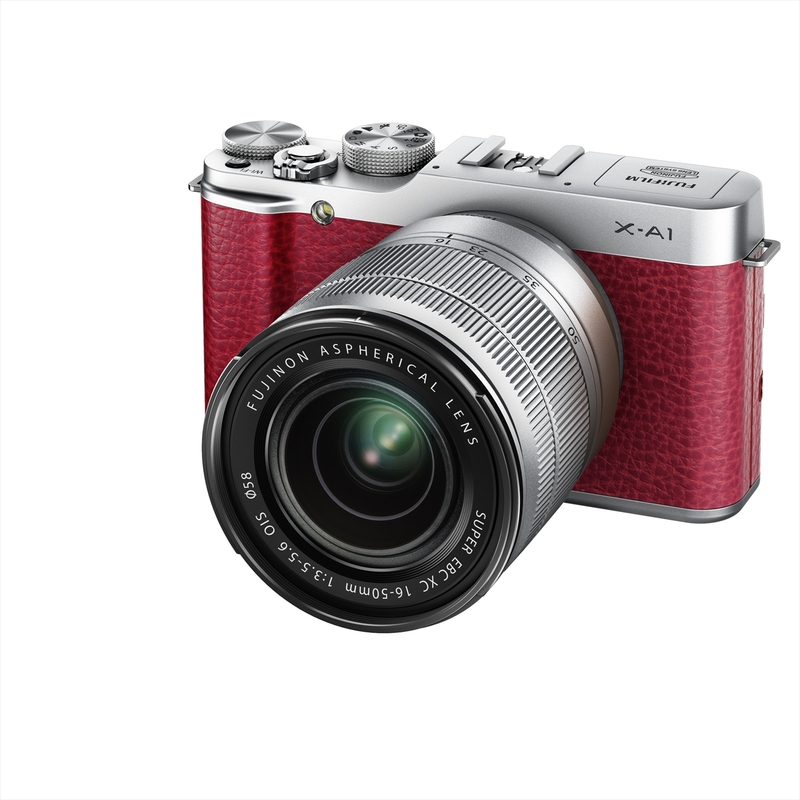 At just 330 grams*4 , the FUJIFILM X-A1 is lightweight compared to many interchangeable lens system cameras. Yet at the same time it incorporates a large APS-C CMOS sensor, a tiltable high-definition LCD monitor, a built-in flash, Wi-Fi®* image transfer and a hot shoe. 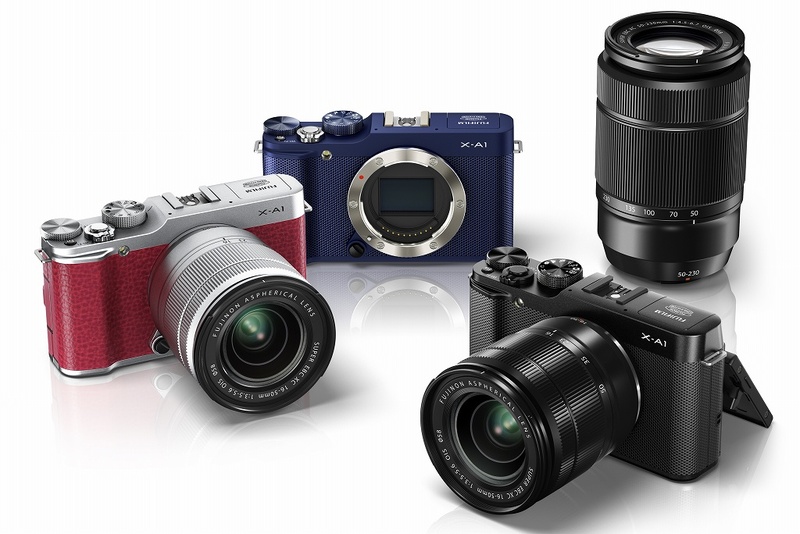 With the feel of FUJIFILM X, the FUJIFILM X-A1 echos the popular FUJIFILM X-Pro1 and FUJIFILM X-E1 cameras but this time it’s available in three colors: Black, Blue and Red. Black and Blue are covered with a dimple pattern of the leather on the body. And, Red is covered with the leather same as popular leather in FUJIFILM XF1. These synthetic leather covering enhance the feel of the camera in the hand, with texture that resembles genuine leather. It balances functionality and cool stylish design, thus allowing for a wider use. The 3-inch high-definition LCD screen tilts up and down facilitating “worm’s eye view” shots of flowers and pets, as well as allowing you to capture in-the-air shots over a crowd of people. The FUJIFILM X-A1’s high-precision built-in flash, rated at the equivalent of Guide Number 7*5, uses Fujifilm’s Super Intelligent Flash technology to regulate the amount of light it fires depending on the scene. In low-light indoor portrait shots (or for close-ups of accessories / plates of food), the flash controls its output to reduce highlight clipping. It also provides the perfect fill-in flash when photographing people in backlit conditions or under intense sunlight casting strong shadows on the face, ensuring your shots are perfectly lit. The wireless image transfer function allows users to transfer photos immediately to a smartphone or tablet PC. It broadens the enjoyment of photography through the easy uploading of your favorite images to social networking sites or just enabling you to share them with your friends. The camera has a built-in wireless image transfer function that uses the dedicated “FUJIFILM Camera App”, available as a free download, to instantly transfer and save your favorite photos to a smartphone or a tablet PC. Beautiful images of your choice can be transferred with the Wi-Fi®* button ready for uploading to SNS or sharing with friends. Users can also view and import pictures and videos to the camera from a smartphone or a tablet PC. The function can also retrieve location data from your smartphone to add the information to pictures you take. Additionally a PC Autosave feature is available, via Wi-Fi®*, this provides a simple means to back up your photos to your home PC. Just install the free “FUJIFILM PC AutoSave” software onto your PC and select which folder you want the photos to back up to, and then by linking your Wi-Fi®* router and the X-A1 you will have set up a very simple to use backup for your photos on your home PC. Both incredibly useful and a big timesaver! With eight Advanced Filters, users can add special effects pre-image capture: namely Toy Camera, Miniature, Pop Color, High Key, Low Key, Dynamic Tone, Soft Focus and Partial Color (Red/Orange/Yellow/Greem/Blue/Purple). The camera also offers a Multiple Exposure mode which allows you to superimpose a second exposure onto the first exposure for a truly creative touch. Additionally, Film Simulation modes feature five different effects that emulate the looks that used to be captured by different photographic films: i.e. PROVIA (standard) for natural color reproduction, Velvia (vivid) for saturated tones, ASTIA (soft) for soft graduation, Monochrome and Sepia. The FUJIFILM X-A1 records Full HD video (1920×1080) at 30 frames per second. Additional creative effects can be used when shooting videos including Film Simulation options (eg: Monochrome), and beautiful “bokeh” can be achieved by the large APS-C CMOS sensor using a low value of aperture setting. And, the movie button enables you to instant switch to movie recording even while shooting still images. Compatible with all FUJIFILM X Mount lenses, the FUJIFILM X-A1 is particularly suited to the two FUJINON XC lenses that have been recently announced. Compact and lightweight, the XC lenses have been designed to be paired with our entry and mid-range compact system cameras and cover a wide range of focal lengths. The XC16-50mmF3.5-5.6 OIS zoom lens (24mm-76mm equivalent)*6 covers the focal lengths of 24mm to 76mm*6. It is ideal for a variety of scene types including indoor shooting, landscapes and snapshots. Consisting of 12 high quality all-glass elements in 10 groups including 3 aspherical elements and 1 ED element, it features seven round-edged aperture blades, which offers 17 stops in 1/3 steps for precise aperture control. The use of lightweight lens elements and a high-precision stepping motor has enabled the camera to deliver high-speed autofocus. Coupled with optical image stabilisation, the FUJINON XC16-50mmF3.5-5.6 OIS lens ensures that you capture all your shutter opportunities. Designed to complement the different colors and cool classical design of the camera, this lens will be available in two color options: Black and Silver. Taking over where the FUJINON XC16-50F3.5-5.6 OIS lens finishes, the wide zoom range of the FUJINON XC50-230mmF4.5-6.7 OIS, starts at 76mm and goes to 350mm(*6) with consistently outstanding optical performance all the way through. The powerful 50-230mm lens will let you capture your subject at a distance with clarity. The all-glass 10 group / 13 element lens configuration includes 1 aspherical lens and 1 ED lens. Superb optical performance is ensured via optical image stabilisation effectively minimising blur when shooting at longer focal lengths or in low light. This lens will also be available in two different colors, Black and Silver. Leather Case: Specifically designed to fit the FUJFILM X-A1, the case offers protection to your equipment whilst also providing the right amount of grip and the premium finish of genuine leather. *4 Including the battery and memory card, excluding the lens. They just keep coming along don’t they these cracking offerings from Fuji. I’ve decided I want to go down the Fuji route, their products and technology is just so good.